Robert W. “Bob” Perry of Woburn, March 30th. Beloved husband of the late Eleanor R. (Santoro) Perry. Devoted father of Robert “Bobby” Perry, his wife Toni Chandler of Leominster, Jane Kenton, her husband D. Clark of Woburn and the late Maryanne Lantagne, her living husband Bernard of VT. Dear brother of Lorretta McCarthy of Wakefield, and the late Mildred Dowling. Cherished “Papa” of Amy and Lenny Milligan, Brian and Betsy Lantagne, Julie, Joanna, Nick Perry and Miles Chandler, and Michael, Joseph, David and Christopher Kenton; and great “Grandpapa” of Tesla, TJ, Hana, Jack, Leo, Michael and Luke. A Funeral will be held in the Lynch-Cantillon Funeral Home, 263 Main Street, Woburn, on Thursday, April 4th, at 11 a.m. Interment in Woodbrook Cemetery, Woburn. Relatives and friends are respectfully invited to calling hours Thursday morning from 9-10:45 a.m. prior to the Service. At the families request, in lieu of flowers remembrances may be made in Bob’s honor to the Ascend Hospice, 100 Locke Drive, Marlboro, MA 01752. Robert W. “Bob” Perry, passed away Saturday March 30th at Windrose in North Woburn. The beloved husband of the late Eleanor R. (Santoro) Perry, he was ninety three years of age. Born in Somerville, Bob was the son of late Anthony and Mary (DuPont) Perry. Raised in Somerville for several years Bob’s family moved to Belmont. There he graduated from Belmont High School. 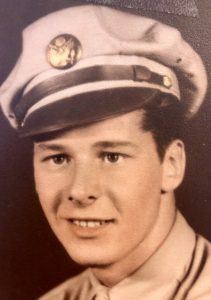 In November of 1943, Bob enlisted in the United States Army Air Forces, proudly serving our Country during World War II. During his time in Europe he served as an Aeriel Photographer Gunner, serving in Battles in Rome-Arno, Rhineland, Northern Appennines, Air Combat Balkans and both Northern and Southern France; Bob was the very proud soldier who was the recipient of Eame Ribbon with six Bronze Stars along with an Air Medal and two Oak Leaf Clusters. Upon Bob’s return home, he always had a great love of music, oldies but goodies, big band and many other genre’s. Well, he decided to persue a career in music,graduated from Emerson College with a degree in communications and began a wonderful career as a disc jockey on WCAP a.m. out of Lowell! He absolutely loved his job and was a disc jockey that kept the station hopping! He retired after twenty years to care for his ailing wife. After her death he perused a career change, entering into the realm of Education where he taught geography and social studies at the Middle School in Wakefield. During his tenure there he had received his Masters in History from Salem State College. Summers during his time in education were spent working for the Cambridge Re-Development Authority. All throughout his life Bob was a presence. He was there to help any one in need. He volunteered at Wilmington Woods to help feed those who were in need of assistance, and he did this for just about a decade, while his mother resided there and even for years after her death. Through his involvement he met some very near and dear friends. With these friends they gathered frequently over the years playing card and pool, establishing a true group of friends. Bobs home and garden were meticulous! He loved his garden, lawn, and vegetables, taking a great deal of pride inside and out. When anything needed repair, Bob was the man, he could take care of just about anything, and did! He enjoyed reading, solving cross words puzzles and watching a good movie. The greatest dimension of Bob’s life was that of his family. As they grew and grandchildren began arriving “ Papa” could not have been prouder! He had a lot of fun with his children and grandchildren and took great pride in all that they did. And beautifully in return all of his precious grandchildren took great pride in their “Papa”. Beloved husband of the late Eleanor R. (Santoro) Perry. Devoted father of Robert “Bobby” Perry, his wife Toni Chandler of Leominster, Jane Kenton, her husband Clark of Woburn and the late Maryanne Lantagne, her living husband Bernard of VT. Dear brother of Lorretta McCarthy of Wakefield, and the late Mildred Dowling. Cherished “Papa” of Amy and Lenny Milligan, Brian and Betsy Lantagne, Julie, Joanna, Nick Perry and Miles Chandler, and Michael, Joseph, David and Christopher Kenton; and great “Grandpapa” of Tesla, TJ, Hana, Jack, Leo, Michael and Luke. A Funeral will be held in the Lynch-Cantillon Funeral Home, 263 Main Street, Woburn, on Thursday, April 4th, at 11 a.m. Interment in Woodbrook Cemetery, Woburn. Relatives and friends are respectfully invited to calling hours Thursday morning from 9-10:45 a.m. prior to the Service. At the families request, in lieu of flowers remembrances may be made in Bob’s honor to the Ascend Hospice, 100 Locke Drive, Marlboro, MA 01752. Jane and Family, I am very sorry for your loss. Our thoughts and prayers are with you during this difficult time. Sincerely Kevin McDonough.